Helping to make our transportation habits more sustainable is one way to a greener world, and getting people on bicycles for their daily commute and errands, or just for fun and fitness, could be a great green business idea for bike enthusiasts. And while bicycles are an extremely efficient mode of transportation, new bikes aren’t quite as green as you might think, due to the impact of their supply chain and the resources needed to manufacture them. A more sustainable choice is a used bicycle, and with the huge amounts of secondhand bikes sitting in garages, thrift stores, or just gathering dust in backyards, there’s a big opportunity in turning these used bicycles back into functional bikes that will get ridden every day. 1. What is a used bicycle retailer? A used bicycle store takes in used bikes, fixes them up, and sells them at a premium. This not only creates a second life for bikes that might have instead gone to the landfill, it also provides inexpensive and eco-friendly transportation alternatives. In addition to selling used bicycles, this business can also provide parts and service for customers, whether the parts are sourced from other secondhand bikes or are purchased new. There are no formal educational or training requirements for this job. However, knowing how to spot a quality used bicycle frame and components is an essential part of being able to refurbish bikes that will last a long time and be enjoyed by their riders. While there are paid courses for bike mechanics, much of what you need to know in order to service and rebuild used bicycles can be learned by doing (or from watching some of the many bike videos available on YouTube). In addition to knowing how to fix up the bicycles you acquire, you’ll also need to learn how best to price these used bicycles in order to provide the best value to your customers, while also making a profit for yourself. $$ (on a scale of $ to $$$$$) This green business idea could potentially be started in your garage (depending on your municipality’s regulations on home businesses, but in order to have more space for working on the bikes and displaying them, you may want to look into renting a storefront. 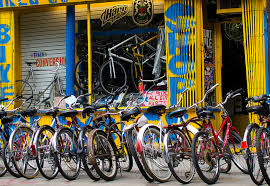 Operating a used bicycle store will also require at least a basic set of bike tools, including a bike stand, as well as a variety of common bike parts (brake pads, chains, tubes, tires, etc.). Unless you’re a great scavenger, you’ll also need to invest some money in purchasing some used bicycles to get started (garage sales and thrift stores can be great places to start looking). $$ (on a scale of $ to $$$$$) While the volume of used bicycles you can sell is one determining factor in income potential, learning which bikes can command the best price will help boost your profits even with a lower volume. 5. What is the best location for a used bicycle retailer? Do you know how to sell a bike and remain patient and helpful while finding a good fit for a person’s wants and needs? Are you organized enough to keep track of lots of parts and products that are entirely not uniform?